I’ve been flying Air France for quite some time now. On my last flight to Paris from New York, I was called up to the Air France agent desk at the boarding gate. I assumed they needed to check my passport as I had just renewed it, but much to my surprise, I discovered I had been upgrade to Premium Economy! Now, I love a window seat, and to be honest I would have turned down the upgrade if it didn’t have a window seat, but thankfully one was available! 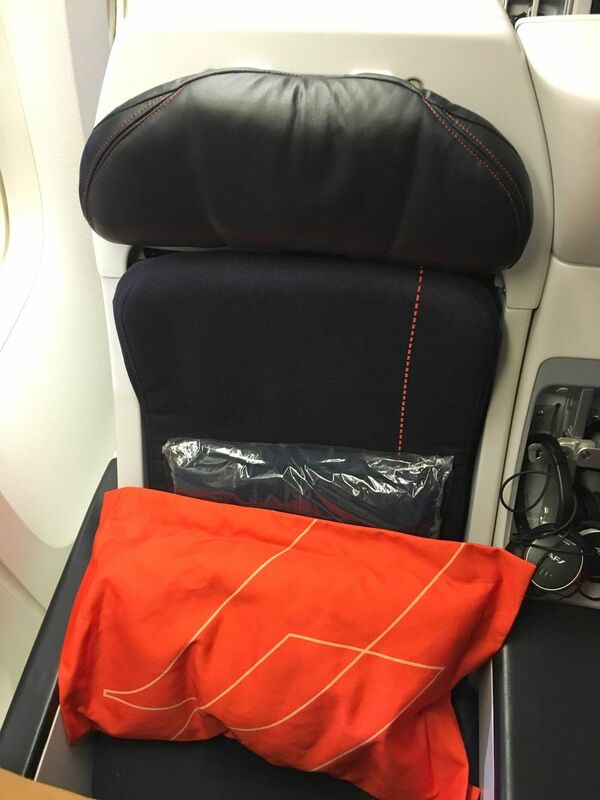 I had made an effort to fly Delta / Air France all of last year, so I was pleasantly surprised that my loyalty to the airline had finally paid off. I was given a new boarding pass and allowed to board with the other Premium passengers. Even my luggage was upgraded to land on the Baggage Claim carousel among the first! I boarded the plane and sat in my much larger, comfortable seat. 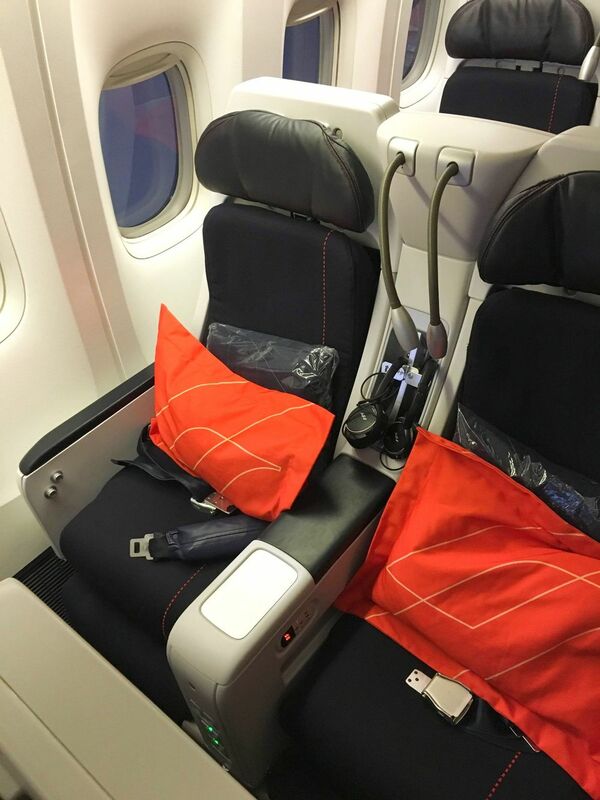 While Premium Economy is still a step down from Business class, the seats are certainly much more roomier than traditional Economy class. The biggest visual differences were the armrests which are large enough to hold two arms, and the noise-cancelling headphones that are provided. You are also given a small water bottle immediately upon boarding (located next to the screen). After taking off, we were all given little blue pouches filled with in-flight goodies. 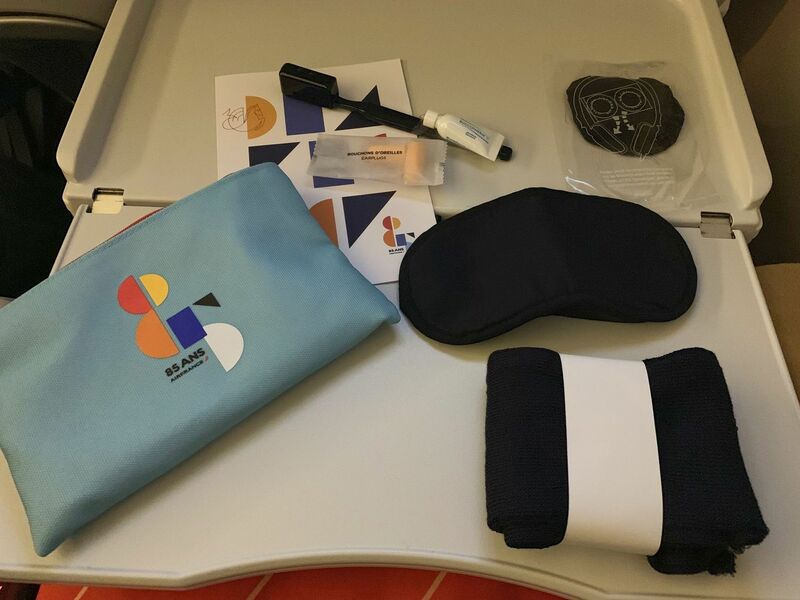 The pouch was decorated with the number 85 to celebrate Air France’s 85th anniversary. The pouch contained: earplugs, a toothbrush and toothpaste, sanitary covers for the headphones, long socks, and a sleeping eye mask. Next up was dinner. 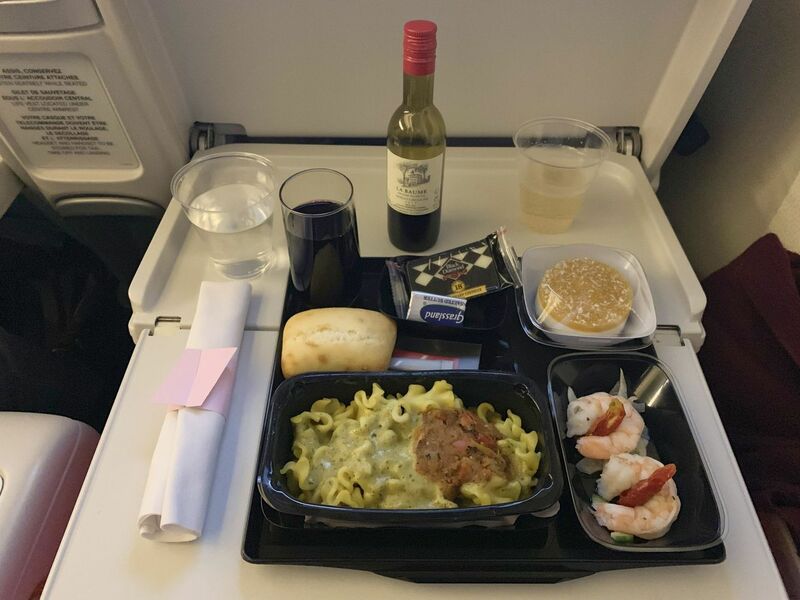 I don’t think the meal itself was any different than what would be served in the Economy section, but I’m always happy with Air France meals so that wasn’t a problem for me! I chose a pasta meal with shrimp appetizer, wine and champagne. I was really thankful I got this upgrade during an overnight flight so I could take advantage of the reclining seat capability and hopefully sleep better. Now, this seat does not lie flat but it does recline quite a bit. What’s really interesting is that in normal Economy, your seat physically reclines backwards, giving the person behind you less space. 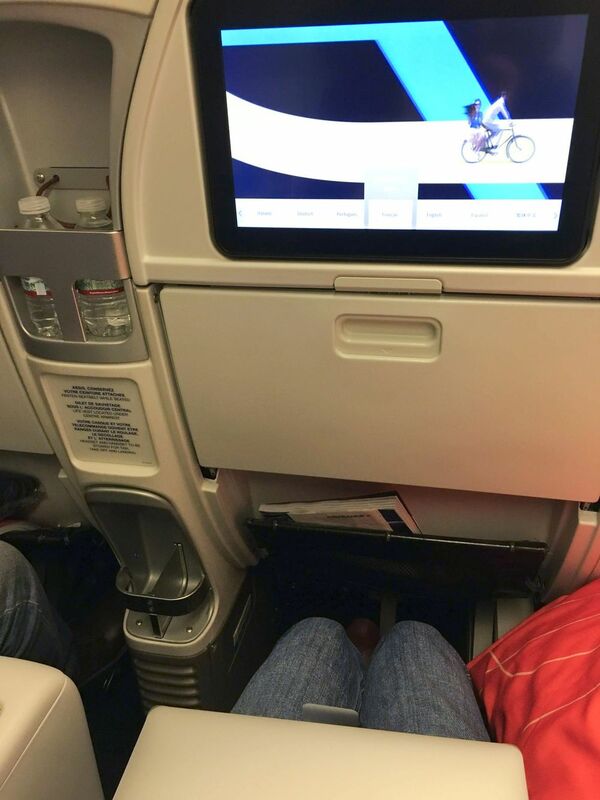 In Premium Economy, your seat actually slides forward, and a foot rest pops up, allowing you to recline while having your legs supported. There is no leg support in normal Economy. Honestly, I wasn’t too impressed with the reclining seat, and it didn’t really improve my ability to sleep the way I hoped it was. It was just a different way of reclining, but not necessarily better. 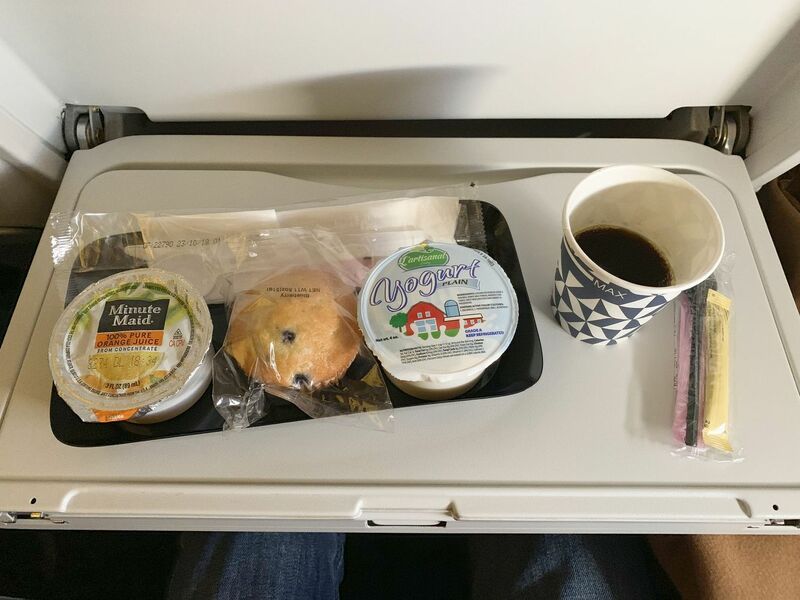 Breakfast was nothing special – as to be expected in Economy class. I had a yogurt and muffin along with orange juice and hot coffee! For me, the value in this type of seat is the non-intrusive back. As a writer, I love taking the opportunity to write on my laptop during flights without wifi. Of course, I’m always seated behind someone who decides to recline their seat, even during a daytime flight, which makes seeing my laptop screen quite difficult. Aside from that, the increased cost didn’t really seem justified to me, so I’m happy this was a “free” upgrade on my end! 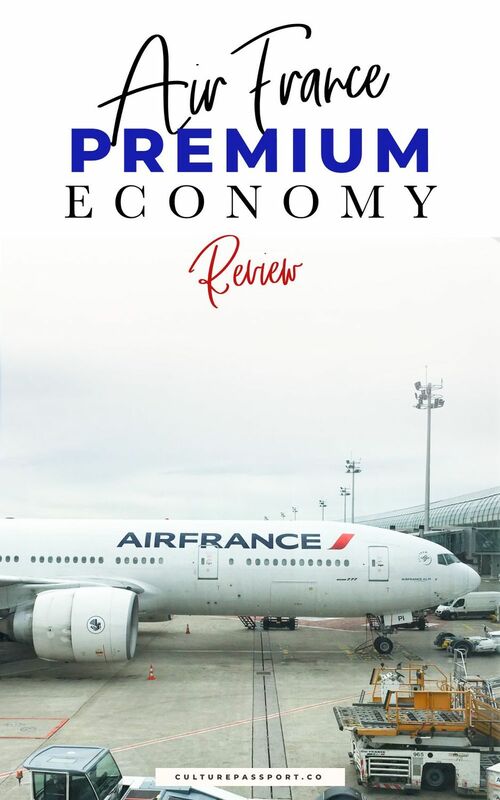 Have you flown Air France Premium Economy? What was your impression of the experience?